The Maine Outdoorsman: Bigfoot Sighting? This Picture is Obviously Meant to be Humorous BUT for a more Serious Look at Finding Maine's Bigfoot Be Sure to Read: "Finding Maine's Bigfoot". 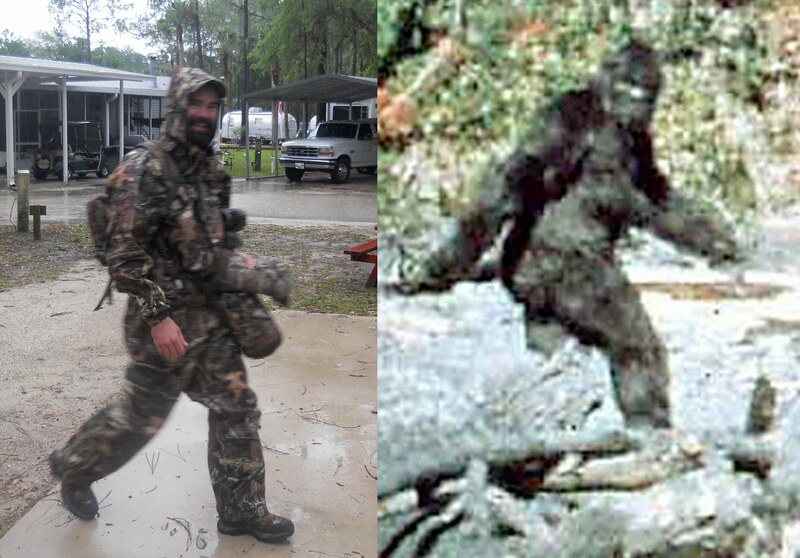 Bigfoot or Very Wet Floridian Turkey Hunter? You Decide! It really could go either way! interesting to say the least. An amazing resemblance. Glad I shaved after the Florida expedition. At least the wife says I now look 1/2 human. Jeez - I can't really tell which is which? Talk about a warm and fuzzy feeling. I have to admit, that's the funniest thing I've seen all day! I don't know. Looks an awfully lot like Bigfoot :). Joe . . . thanks! HA! PenBay . . . Yet more ammo to us against me when our paths finally cross in Grand Lake! Why do people still show this as evidence when some guys have already admitted to faking it?????????? yeah i agree with anonynous!!!!!!! !